The Woods knew. I was on my way to make an offering at the Fairy Tree that was Kissed by the Winds, but she was no longer there. Not in the way of the rest of the trees whose breath was slowed with the cold; but her dead body was hacked into pieces by a metal band of biting teeth who show no mercy as the hands that hold them, can feel no pain from the Woods. The screams of the Woods fall on deaf ears, even if the sound of the metal teeth do not yell to over the top of the pain. I did not know of this death yet, but the animals did try to warn me. 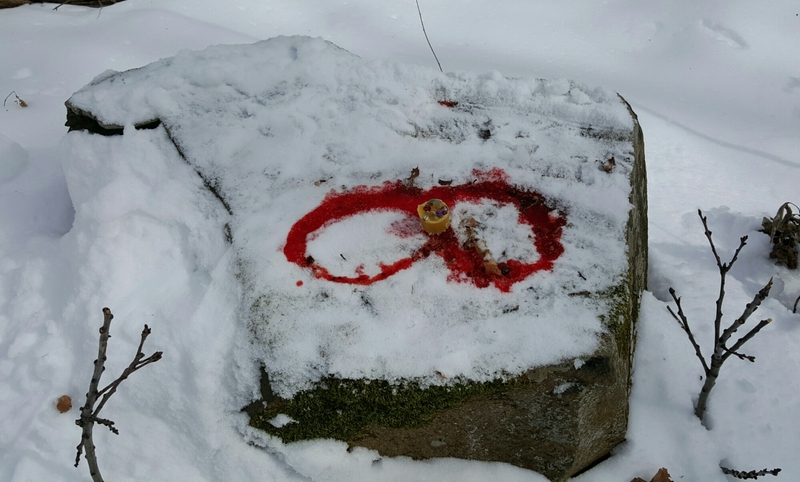 One white skull lay in my path in the middle of the snowy woods. Day old snow allowed for all who walk to be seen and their paths to be known. There was only the one track of the bobcat that I was following in the area. Like a face from the ancestors, staring out at me from another time, a white skull of a Skunk with white teeth that brought nourishment as they bit, sat upon the path. What memories are held in the white bone? Those memories will eventually break down into tiny pieces, that will nourish the plants of the Woods. Then the Trees will know all of the memories of that skunk as the nourishment fills them. I pick up the skull and wonder how long it would take for me to take in the memories of the skunk. The Woods do this job perfectly. Perhaps I can be taught. 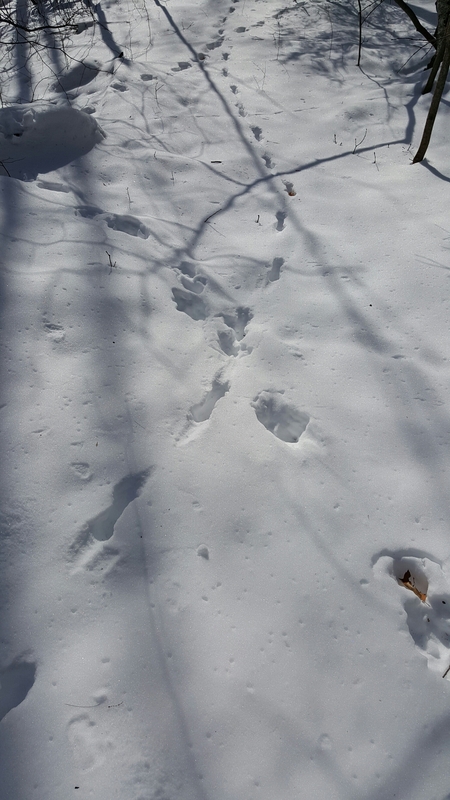 I continue walking along the path of Bobcat, though I notice that due to height differences, we chose slightly different paths and our tracks look like an abnormal strand of DNA as I look back to where we travelled. Two completely different animals walking in the Woods for different reasons, but still our paths criss crossed regularly. I wonder what the Bobcat would think of that as he walked back across the path at some later time. I come to the area where the Fairy Tree was revealed to me and I slow, as houses are now near. I am walking between worlds,though those that might see me back behind their house may not be understanding of that knowledge. I crouch down lower and I begin to panic. Where is the Tree?! I walk back and forth on the top of the ridge, not wanting to draw attention by going lower and out into the open. My heart is racing now. I open myself up to the Woods to ask where the tree is…sadness. I knew. The tree laying down in the little valley just at the outskirts of the new houses, is Fairy Tree who was Kissed by the Winds. She wasn’t far enough into the Woods to avoid direct contact with humans. I allowed myself to walk down the hill, not caring who saw me, and realized her trunk was cut into pieces at the base, then left separated from her tree top, which was sprawled unceremoniously a few meters away. Her branches reached up and out from the ground, as if clawing for life on their final descent. To say my heart broke is cliche and an understatement, but I will still say it. I knew what I had to do when I looked down at my offering; knowing it wasn’t enough, but it would be a start. I opened my Heart and senses even more to feel more than the sadness. I felt Them. Scared. Wary. Depressed. Without a Home. I stated my intentions out loud, so the vibration was clearer, took two branches from Fairy Tree, after making an offering and thanking her for her beautiful life, and walked away from the fallen tree. I followed Bobcat’s tracks once again, but broke off once reaching the Stone Wall. I walked through the mountain laurel and petitioned He of the Dark Wooded Places to allow newcomers to join, as they had lost their Home. I felt the acceptance and continued my walk to where Fairy Stone’s original space was located. The offering was made. The location was marked. I did not turn around to see if they followed me, out of respect, but even if they followed later, the path was laid and easy to follow. My Home is their Home. Our paths criss cross in the Woods at DragonFly Hill. How many paths criss crossed mine that day, I am not sure. All I can do is follow the Lemniscate and send Love to all others who do as well. Thank you, Tinah Bee! You inspire me so!